Thank you for your interest in the Peace Development Fund. We are excited to announce the launch of our new website and encourage you to take a look! WomenCrossDMZ at the UN Conference on Status of Women, March 11th 2015. Fifteen years later, PDF grantee Women De-Militarize the Zone models women’s leadership in peacemaking. Women De-Militarize the Zone plans on crossing the De-Militarized Zone (DMZ) separating North and South Korea. “It’s hard to imagine any more physical symbol of the insanity of dividing human beings,” states the co-chair and feminist activist Gloria Steinem. Indeed, the DMZ is highly militarized and has been dividing Korean families for roughly 6o years. Thirty international women peacemakers will be walking on May 24, 2015. Counting two Nobel Peace Prize laureates, the women’s delegation will hold an international peace symposium in Pyongyang and Seoul where they hope to engage in a dialogue with Korean women. “Women ‘s leadership is urgently needed to break the impasse, revive diplomacy, and put squarely into the security discourse the experiences of those most directly impacted by military violence,” states Christine Ahn, the coordinator of the march. The Korean conflict started in 1950, when North Korea, supported by the USSR and China invaded South Korea. Even though a ceasefire agreement was signed in 1953, no peace treaty has ever followed. Sixty years later, North and South Korea are still at war. While people struggle to survive an economic crisis in North Korea, governments in the region deprive their population of developmental investments in order to increase militarization. Instead of investing in health care or education, Korean officials pay for weapons. Demilitarization is a crucial issue in the region. “In addition to organizing the march, we would very much like to build a grassroots movement of women dedicated to seeing peace on the Korean peninsula,” says our grantee. The action of Women De-Militarize the Zone is not going to stop after May 24th. Members are planning to organize educational workshops that inform and mobilize women for international peace-making. Who’s Next, What’s Next, Why? It takes a village to raise a child and it takes a community to sustain the village. This logic, this truth, goes on: it takes a nation to sustain a community and to raise a child. And finally it takes all of us, global citizens everywhere, to sustain the aspirations, the dreams and the hopes of all families. No child should be subjected to the violence that was perpetrated in Newtown, CT, a community in PDF’s larger New England neighborhood. So we have a responsibility to respond, to raise our voice and to ask some of the questions that need to be asked. I don’t know about you, but I feel the same horror and anguish when a drone blows up women and children at a wedding party as when I see the endless coverage of Newtown. Malala Yousufzai from Pakistan, Oscar Grant and all those children in Somalia, or Aurora, or . . . the killings of young men and young women on the streets of Oakland or Roxbury or Nairobi. Parents all feel the same grief. Relatives feel the same sorrow and nations feel the same wounds. It comes to all of us to recognize ourselves in grieving parents, in a shattered community, in the world we witness every day, watching as children pay and pay for a world we as adults can’t seem to get right. Our universality is what is at stake. Comments : Comments Off on Who’s Next, What’s Next, Why? What’s in a Peace Talk? At a Peace Talk this fall, one of our grantee speakers wanted to know what our criteria was for a successful event. Would it be the number attending? Donations to PDF as a result? No, we told him. It is not the number of attendees, because at PDF’s Peace and Justice Center in Amherst, we can’t hold hundreds of people. If there are 15 to 20 gathered in our living room, that is a perfect size for a discussion. No, it is not the donations PDF would receive, we continued. We don’t use the Peace Talks to buttonhole people into giving. Our donors are loyal, and we dare say they would give to PDF’s work even if there wasn’t a Peace Talk on the event schedule. But a Peace Talk is an opportunity to publicize the work of our grantees and engage our audience in the ongoing work of organizing. That is how we measure success. 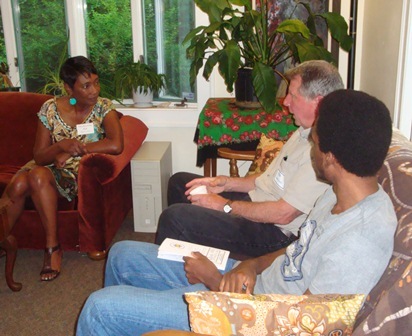 Anyone who comes to a Peace Talk can hear directly from our grantees about the challenging and inspiring work they do. It is also an opportunity to network with others working for progressive social change, be they grantees, donors or students from the local colleges. Not a Peace Talk ends before we hear folks exchanging ideas and email addresses. And the grantees say they couldn’t do that—get out of their daily routine and the silos that build up around them—without someone from PDF inviting them to a Peace Talk. At Peace Talks we talk about victories and losses, the 99 percent and the one percent, the stories we know and the ones nobody writes about. We talk about how to move forward and how to keep going. As Jaclyn Friedman of Women, Action and the Media said at our last Peace Talk, “I have to remind myself that the partial wins are still wins.” We need to keep reminding ourselves of that too, as we define success. “Each of us takes the piece of the work that we can do,” says Jaclyn. For PDF, it is providing the space for organizing. Comments : Comments Off on What’s in a Peace Talk? The United Nations has undertaken a formal study of the Doctrine of Discovery, that which “authorized” and made acceptable the taking of indigenous lives and lands throughout the western hemisphere and around the world. This was “because” the indigenous (original) people were not fully human, and certainly not Christian. There has been a white (European) supremacy presumption in the U.S. going all the way back to before the founding fathers. A white man enters a place of worship, the Oak Creek Sikh Gurdwara (Temple) in Wisconsin, to shoot ten people, six to death. Could this have anything to do with power/powerlessness in the context of the ravages of the “free enterprise” system? Or with U.S. history, slavery or racial profiling? It may be one strand of our cultural DNA. At PDF, looking at this brilliant blind spot, we understand that developing peace means understanding history, coming to terms with it, building new systems, re-programming ourselves, regardless of cultural identity, to build a peaceful presence in the world. May the community of Oak Creek heal in peace! The Peace Development Fund works to build the capacity of community-based organizations through grants, training, and other resources as partners in the human rights and social justice movements. As a public foundation, we nourish, foster, and encourage the diverse, self-sustaining and economically viable communities that are essential to building a peaceful, just and equitable world. Donate Now to Peace Development Fund!